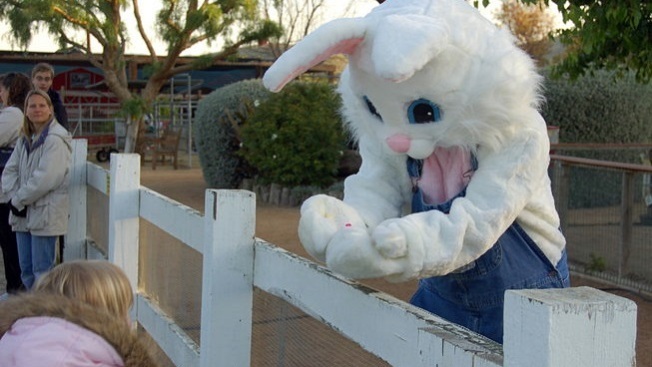 The Moorpark animals-and-agriculture spread will host the Easter Bunny over several days in April. Say hello to the fellow with the long ears while calling upon the Moorpark family favorite. The dates of the Big Bunny's visit? April 1 through 17, 2017. EASTER, so you'll have time to say hello to the regal rabbit before the big occasion arrives, should you want those cute photos ahead of the holiday. There shall be other to-dos, too, around the property, like a "Giant Easter Basket Photo Opportunity," Farmer Craig's Chicken Show, gunny sack races, the ol' egg 'n spoon showdowns, and wagon rides, the kind that have a tractor doing the pulling. There are cute critters, too, lots of them, from goats to chicks, so you'll want to spend some minutes, or, let's be honest, hours, cooing and squealing and generally making a fuss over all of the furry or feathery residents. Cost for the fest? Six dollars on weekdays, $10 on weekends, and the Easter Bunny, and all of the lively holiday goings-on, must hop, hop, hop away on Monday, April 17.